CAUTION has been a watchword in the foreign policy of Barack Obama. But in one part of the world he has been adventurous. For any of the nine preceding American presidents, his planned visit to the Cuba of Raúl and Fidel Castro, on March 21st and 22nd, would have been unthinkable (see article). It crowns a bold gambit in which Mr Obama has restored diplomatic relations, frozen for 54 years, and begun to loosen the economic embargo against the island. He is betting that engagement with one of America’s neighbours will do more than isolation to bring its Communist regime to an end. Moreover, engagement with Cuba will lance a boil that has poisoned relations between the United States and the whole of Latin America. After a period in which China appeared to be displacing America in what some once called its backyard, those links could become increasingly warm and mutually profitable—so long as the next president seizes the opportunity. On the evidence of America’s rancorous election campaign, there is a danger that he or she will not (see article). Mr Obama’s bet is the right one. The American embargo against Cuba is an exercise in futility. It is a cold-war anachronism that hurt Cubans (and Americans) rather than the Castros, who use it to justify their police state and as an excuse for the penury inflicted on the island by communism. The rapprochement comes as Cuba is changing, albeit at the pace of one of those patched-up 1950s cars that delight tourists to the island. Thanks to reforms Raúl Castro started when he took over as president from his elder brother in 2008, some 1m Cubans (one in five of the workforce) are members of an incipient private sector. Revenue from tourism, some of which goes to small businesses, and remittances from the diaspora are growing, just as aid from Venezuela is diminishing. 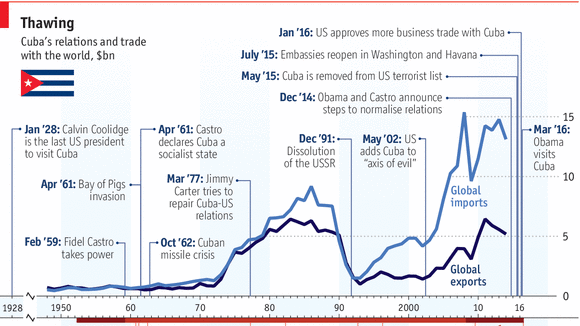 Officially, Mr Castro’s reforms are an “updating of socialism”, not an embrace of capitalism, let alone democracy. Mr Obama’s critics conclude that he has given the Castros a free pass. Yet Cuba was never about to become a democracy overnight. Because the regime remains entrenched, political change is more likely to come gradually and from within. In 2018 Mr Castro intends to stand down as president. His likely successor, Miguel Díaz-Canel, was born after the Castros’ revolution in 1959. Cubans will judge him on his ability to improve their lives, which will require more economic reforms. The hope must be that, as Cuba becomes more prosperous and connected, political liberalisation will follow. Engagement can accelerate this process. Mr Obama is a powerful symbol among the many Afro-Cubans of the opportunities offered by freedom. Contact between two close and related nations through commerce, tourism and the reconnection of families will only feed the desire for change. There is another motive for Mr Obama’s opening to Cuba. The embargo has been a symbolic irritant in relations between the United States and its neighbours. Over the past 20 years or so, Latin American politicians of all stripes have come to oppose it. All the countries in the region have diplomatic and commercial ties with Cuba. The embargo has been taken as a symbol of American imperialism. Even many Latin American conservatives resent it. In recent years the United States and Latin America have in some ways drifted apart. Washington has other preoccupations, from the Middle East to Asia. Latin American countries profited from China’s appetite for their minerals, fuels and foodstuffs. The political cycle brought to power a crop of left-wing, anti-American leaders who saw in China an attractive alternative to the rigours of the IMF and the sometimes hypocritical lectures on drugs and human rights from Washington. This is bad for America. Although no region commands less attention in the foreign policy of the United States than Latin America, no region is more important to the daily lives of Americans. The two halves of the Americas are linked by trade, investment, tourism, family and remittances. Latin America takes a quarter of American exports, a similar proportion to Asia. Mexico, along with Chile and Peru, is a member of the Trans-Pacific Partnership, Mr Obama’s attempt to set the rules for trade and investment in the 21st century. The opening to Cuba can help heal the rift. It comes as the Latin American left is in retreat, because of the commodity bust and its own mistakes. Mauricio Macri, Argentina’s new president whom Mr Obama will visit after Havana, represents a pragmatic centre-right, well disposed to America. 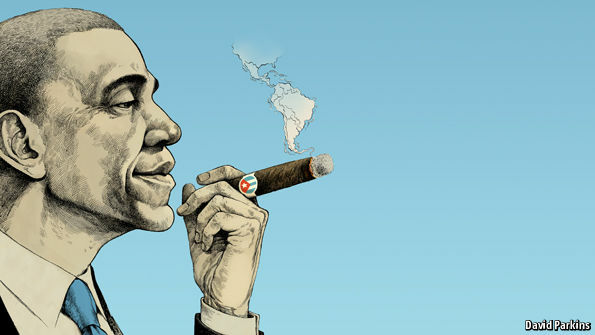 In his second term Mr Obama has become enthusiastic about the gains from closer ties with Latin America. The administration has launched an effort to reduce drug-related violence in Central America. It has helped Colombia’s government in long-running peace talks with the FARC guerrillas, which take place in Havana. Though a final agreement will not be reached before the March 23rd deadline set by both sides, there may be a symbolic handshake between them while Mr Obama is there. As with Cuba, immigration reform, albeit thwarted, and the downplaying of the failed war on drugs assuage long-standing Latin American grievances. There is a risk that Mr Obama’s successor will take a different path. The obvious threat comes from Donald Trump, the Republican front-runner, whose proposal to build a wall along the border, and demand that Mexico pay for it, is an insult to one of America’s most important trade and political partners. The bombastic billionaire’s nativism has influenced other Republican contenders to harden their already uncompromising policies on immigration. The Democrats are less xenophobic than Mr Trump but are tempted by his protectionism. Mr Obama’s diplomacy leaves a choice for the next president: turn your back on Latin America and feed its resentments and failings, or help it become America’s front yard, a region of increasingly prosperous democracies linked by economic and political ties. The visit to Havana is a welcome step down this path.